The other day Eric and I bartered with our friend Will Hiltz for several NICE antique pots in exchange for a raft planting Siberian Elm that Eric had. Being a very generous kind of guy, he threw in a RMJ he had collected several years ago. This tree originally had two crowns, but the one which had inspired it’s collection had died back, leaving a long trunk horizontal to the soil line. Part of the reason we entered into the barter was that when Will had seen the elm during a visit he had such a strong and clear vision for what he would do with it. I found myself feeling much the same thing when I saw this RMJ. I knew exactly what I would do with it. I asked Eric if I could have it… and he gave it to me, not having any strong feelings about it for himself. 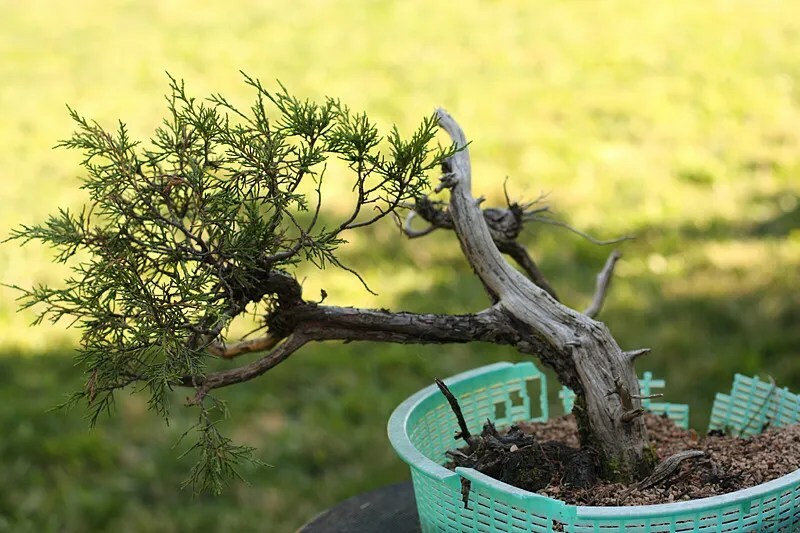 We often will negotiate trees between us… I recently found a gorgeous collected Korean Hornbeam, which I gave over to him, because he’d been seeking one for some time. Anyway… I got home this evening and decided it was a great time to work on the juniper. 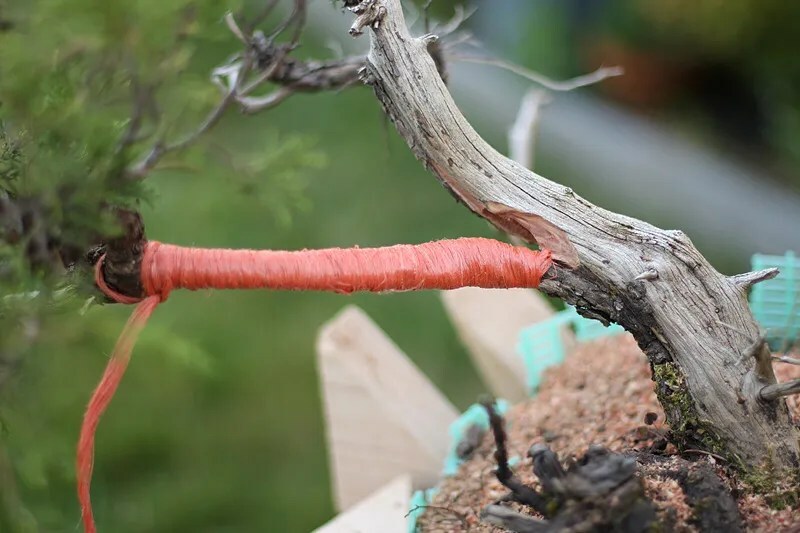 Essentially my plan was to excavate the heavy deadwood to the live vein and move the limb over the center of the trunkline. The heartwood was removed just to the point of being along the vascular tissue to the inner side of the vein. You want to be careful not to remove too much. After the channel was excavated, a section of the deadwood in the main trunkline was also excavated so the moved branch would have a space to move into. 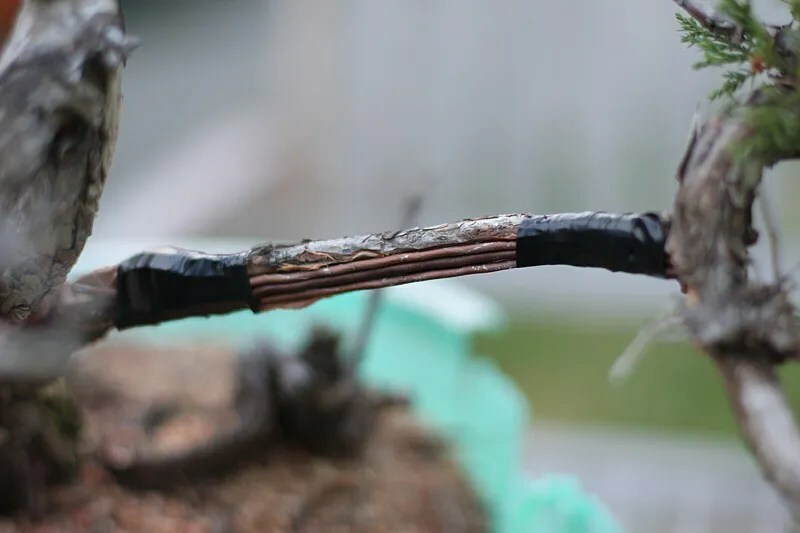 Then the channel had several pieces of aluminum wire measured to fit and was fixed into place with some electrical tape. 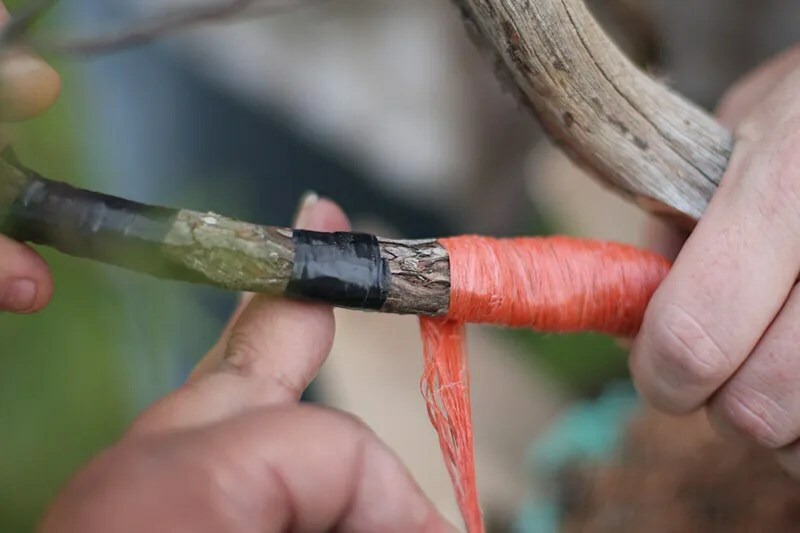 I then began the process of tight wrapping the limb with hay bail twine, which we often talk about but haven’t documented all that well. 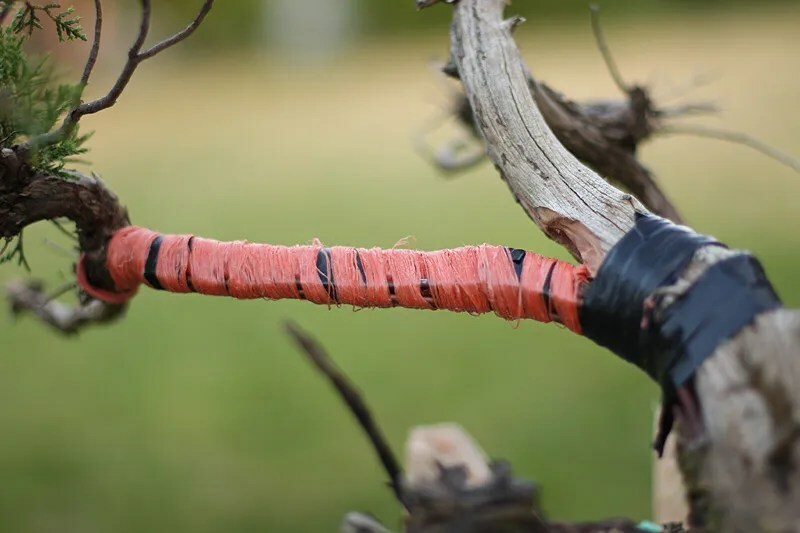 As the twine is being laid firmly against the limb, it’s being unwound so that it lays flat. Eric assisted me with the wrapping, as it’s always easier with two people than one… though it can certainly be done alone. 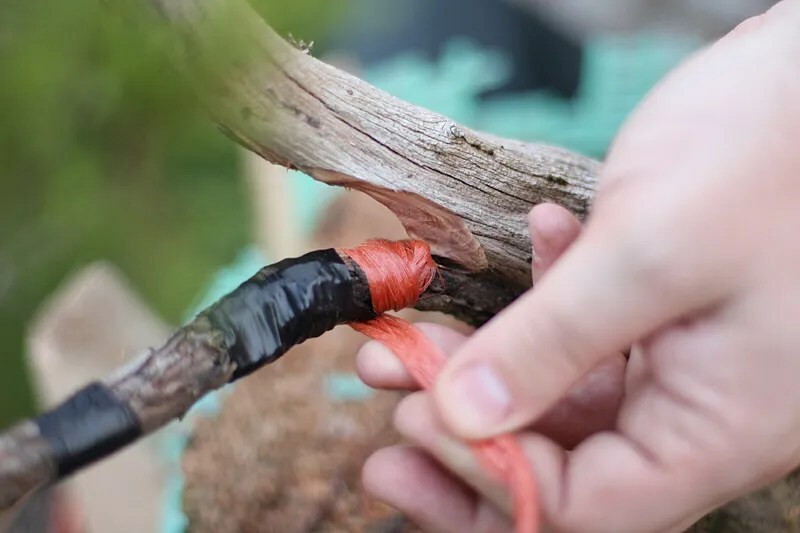 Once the whole branch was covered tightly to close up the channel, a spine of heavier wire was laid against the outside of the limb, and the twine was laid against that back to the base of the limb. Heavy gauge wire was then applied to the branch, and the bend was very easily accomplished. The prep work took longer than any other aspect of this evenings work, but it’s essential to a successful bend of what would otherwise be an impossible move. 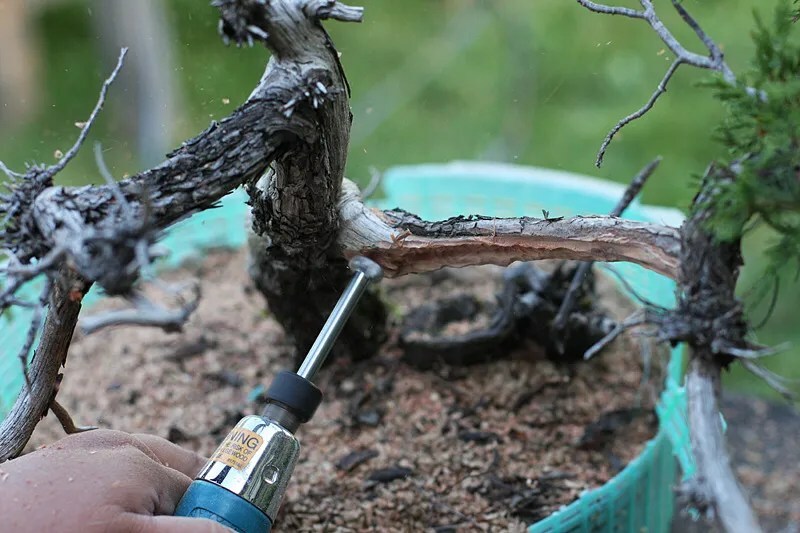 De-lamination of wood is only prevented when great care is taken to evenly spread the force and tension over the whole length of the limb. The tree was slip potted into a container which would be able to be it’s home for the next few years, and was covered with sphagnum to help keep the soil evenly moist as we head into our drier season. The tree will be kept in mostly shade for the next few weeks… I’ll let you know how it does. I would have preferred not to have to move it, but the basket was shattering whenever you touched it. I’m very happy with the resulting image, and will work on foliage placement if it exhibits strong growth next year. To give a sense of how it was bent and twisted, I’ll leave you with this last photo for the moment… and will definitely get a better photo of it when I get a chance in general. 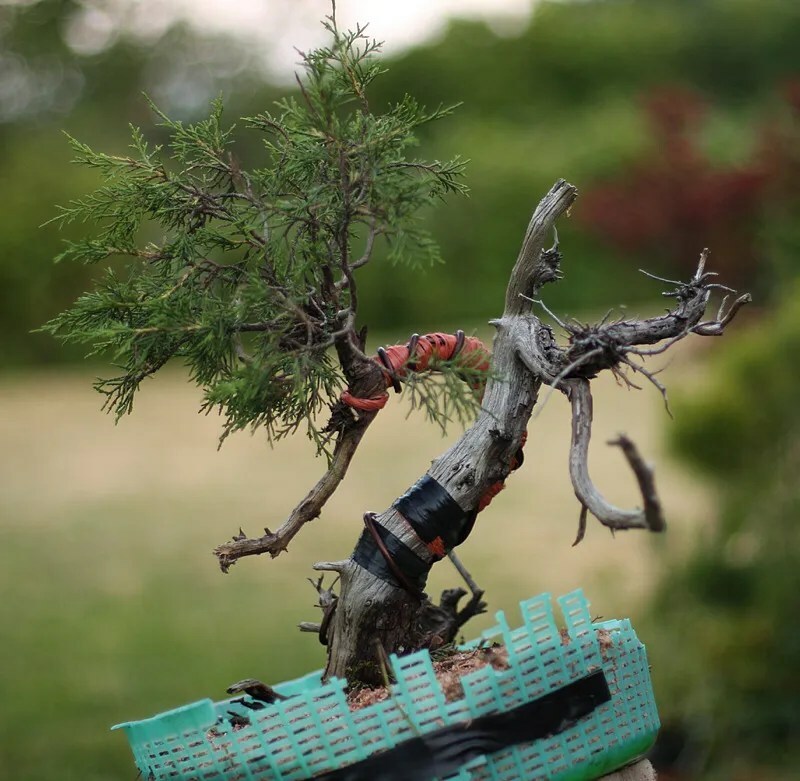 This entry was posted in Bonsai, Deadwood, Design, Horticulture, Photography, Technique and tagged ancient, bonsai, bonsai styling, design, focal point bonsai, gnarly, photography, Rocky Mountain Juniper, wiring by ang3lsdream. Bookmark the permalink. Really cool post Vic. That’s a great description with photos for a new technique. The technique it self is not new, it is sort of the defacto way to move branches that may otherwise be immobile. In this case it was the large amount of deadwood that prevented movement especially in the area of the division. 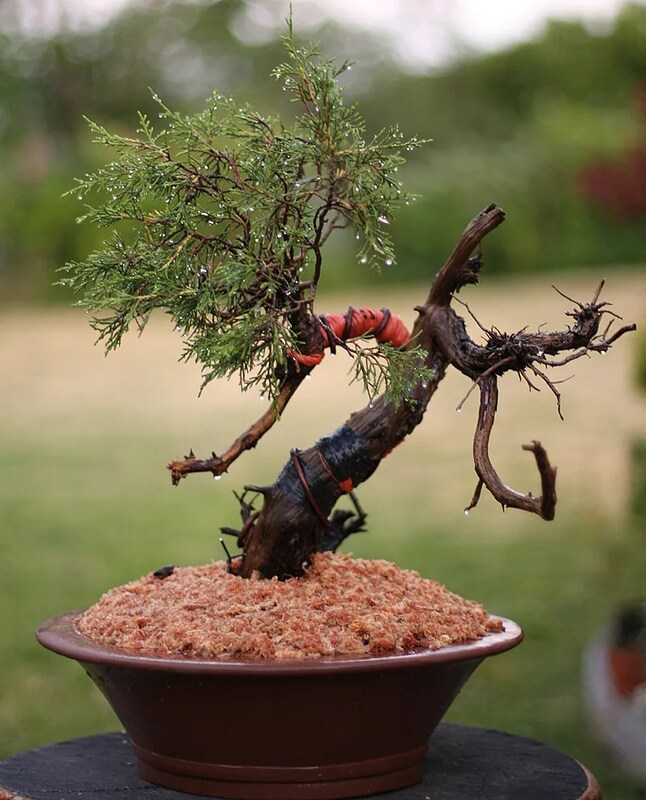 It is not a technique that is often seen on many bonsai blogs, I guess, or at least infrequently. Nonetheless I agree it certainly is well documented. One of the benefits of having a spouse that does bonsai is you always have a willing assistant, and you get to be one too! I had a great time helping Vic convince this tree of her vision. Great work, any update on how the tree is now?